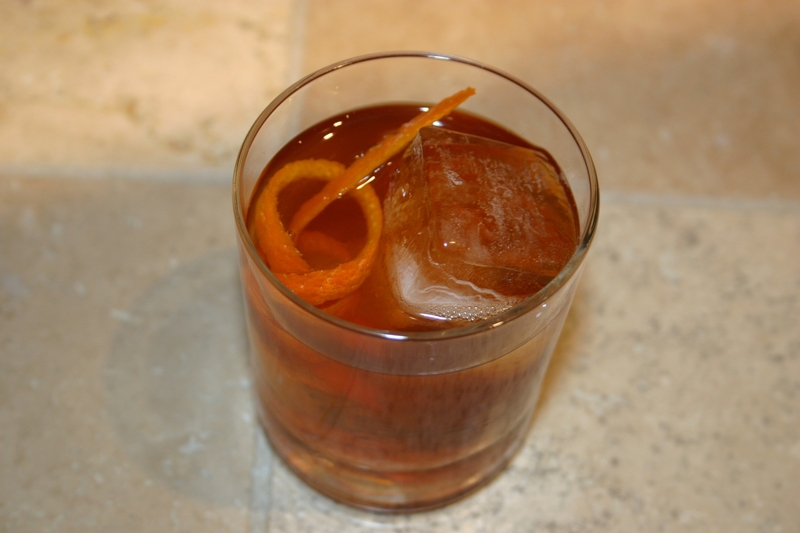 This week’s experimentation with the Old Fashioned has been very rewarding. This is a drink I first mixed up only a couple month’s ago and is now, without question, one of my favorites. As I mentioned in yesterday’s post the drink is simplicity at its finest and truly sums up the classic definition of what makes a cocktail: spirits, water, sugar and bitters. Although Embury’s recipe is very good all by itself and certainly requires no changes, there are a couple small tweaks I like to make. Take a peek at yesterday’s post for full details. My final chosen recipe decreases the simple syrup to 2 tsp, which results in a pleasantly sweet cocktail. As for bitters Angosutra alone is very good, but I encourage you to try some others. You may find you prefer some of the other recipes even more. In looking at a number of Old Fashioned recipes this week I noticed something interesting. A lot of cocktail books call for either muddling of fruit or adding soda water, or both. While neither of these is necessarily a bad thing, they are both completely unnecessary. I think Crosby Gaige summed it up nicely in his 1941 book Cocktail Guide and Ladies Companion. “Serious-minded persons omit fruit salad from Old Fashioneds, while the frivolous window-dress the brew with slices of orange, sticks of pineapple, and a couple of turnips.” When you muddle fruit in the drink you end up with a pulpy mess of fruit carcass floating in your drink, not so nice. Try the drink with the orange twist alone. I think you’ll be pleasantly surprised by the amount of fruity notes it adds. With that, we’ve reached the last of Embury’s Six Basic Cocktails. All of them quite good, although perhaps not always by his recipe. One thing I find interesting is that, of his six, three were sours (The Sidecar, The Daiquiri, and The Jack Rose). This isn’t a bad thing, but it does leave out a number of other cocktail styles such as the collins and the highball. This in mind we’ll be covering some of these cocktails in the weeks to come. Overall Embury was on the right track with his six. My guess is he was attempting to introduce cocktail noobs to some basics that would pique their interest in the cocktail arts. This he most certainly has accomplished. Hope you all have enjoyed these first few weeks and we’re looking forward to the weeks ahead. Until next enjoy your cocktails.